If you have yet to checked out monowall I suggest you do so now. It’s a very lite, easy to use firewall distribution built on BSD. It boasts many features including packet filtering, VPN support, NAT, Captive portal, VLAN interfaces, IPv4 and IPv6 support and a traffic shaper to name a few. I have posted about the IPv6 capabilities in a previous post if you care to check it out. 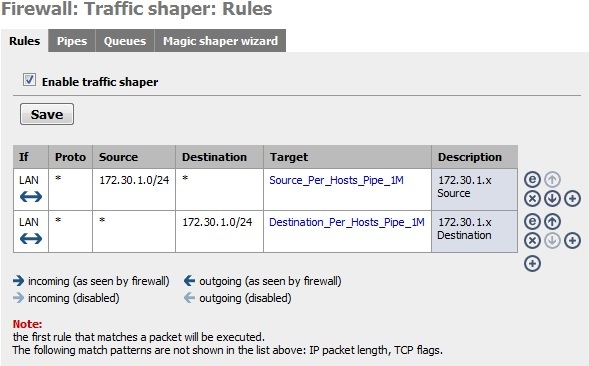 Today, however, I will be discussing rate limiting with the traffic shaper. Recently I was called to implement a system to limit the bandwidth used by our guest network. There was no firewall in place for this network aside from the device provided by the ISP. Needless to say, it was junk and supported none of the more advanced features we needed. I implemented a Monowall with a fairly typical setup and jumped into configuring the traffic shaper. In this article I will only be limiting traffic and will not be discriminating based on the actual type of traffic but will simply limit everything. To recap, the above will limit on a per host basis. If you really wanted to limit everyone to a maximum of 1Mb/s total you would follow the same procedure but instead map to the pipe without a mask specified. Once your configuration is committed its time to test! For this I simply opened the live traffic graph that’s part of monowall. This can be found under Status -> Traffic Graph. 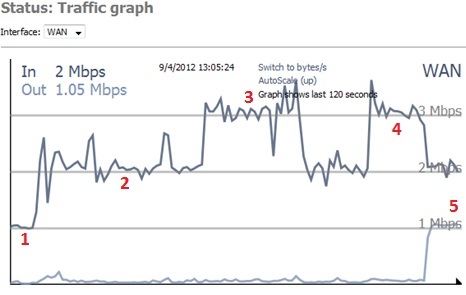 You can see my traffic graph below. I have a few different points numbed on the graph. At 1 I was running a download on a single host. At point 2 a second host began downloading. At point 3 a third host began to download. At point 4 a speed test began downloading and at point 5 the speed test began its upload. As you can see each host was limited to 1Mb/s but the total amount of throughput was not capped. I hope this was useful to anyone searching for traffic control on a monowall! Feel free to comment with questions or suggestions below. This entry was posted in Networking and tagged configuration, monowall, networking, QoS. Bookmark the permalink.